A full length group portrait of three initiated youths wearing ornaments. The youth in the middle is wearing a European comb as a neck ornament as well as thiau arm rings on his right arm. 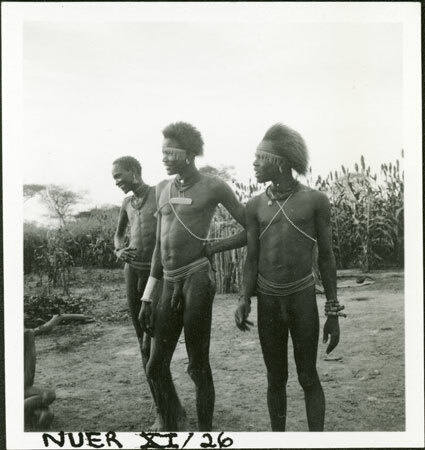 The youths are identified in other images as Gaajok, meaning that the photograph was most likely taken during July 1935 whilst Evans-Pritchard spent 4 weeks at the mouth of the Nyanding River among the Eastern Jikany, especially at Mancom village, the home of his servant Tiop. Note on print reverse ms pencil - "41 5" & print front border ms ink - "NUER XI/26"
Morton, Chris. "Portrait of Nuer youths" Southern Sudan Project (in development). 03 Jan. 2006. Pitt Rivers Museum. <http://southernsudan.prm.ox.ac.uk/details/1998.355.510.2/>.